It has in the nucleus on top, the Phrygian cap, a symbol of freedom, sustained by pica, representation of homeland defense. Completing the allegory clasped hands, an expression of unity and brotherhood of the peoples of the Rio de la Plata United Provinces. On the upper field, in heraldic language, patriotic colors by horizontal stripes, light blue and white, with the lower flat field. 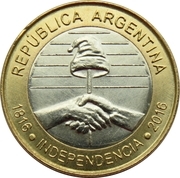 On the ring falls "ARGENTINA REPUBLIC" in the upper arch, and in the lower arch "INDEPENDENCE * 1816 * 2016 " referring to the Bicentennial of Independence of Argentina. 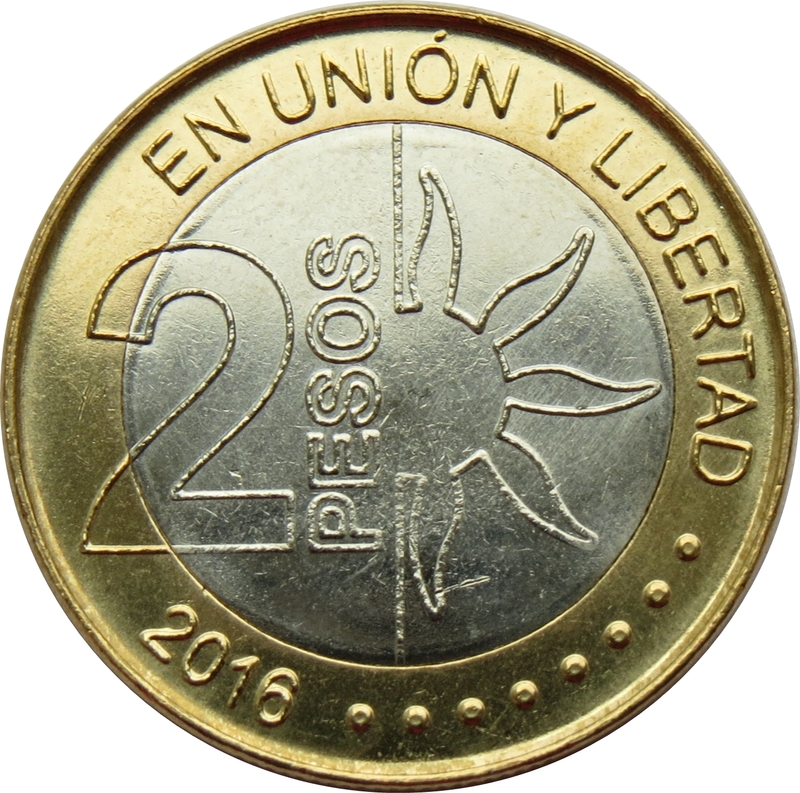 It is seen in the nucleus, on the left, the face value and the word reading "PESOS" vertically. Closes the composition of a stylization of the sun of epaulet military uniform belonging to Gral. Don Jose de San Martin. 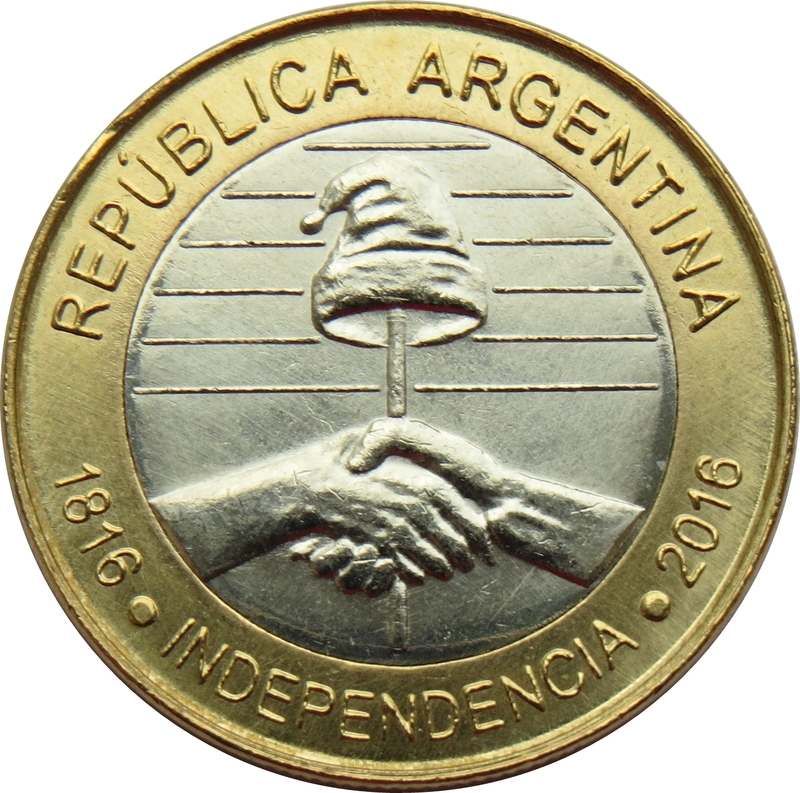 In the ring, the arc top, the motto "IN UNION AND FREEDOM", used since the first patriotic coins minted by the Assembly of year XIII during the War of Independence. 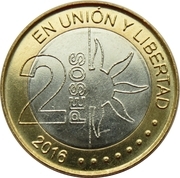 On the lower arch, the year of mintage "2016" to right a milled edge with 8 points.